Besides, the 3D cell culture systems are closer to the in vivo complexity. (2) The problematic to face here is that the physiology is very complex and the only way to approach it is to refine models. As experimental systems became more complex, a lot of variable need to be considered, thus, it is necessary to cross used mathematics, biological knowledge and of course experimentation to better understand which are the best parameters to study in 3D cell culture. Which kind of cells use? The key question. The first question that needs to be answered is which kind of cells used? It is necessary to find a balance between the availability, ease of use and relevance regarding the addressed question. It must be mentioned that each kind of cells needs specific conditions, which can complicate the running of 3D-multicellular structure culture. Primary human cells, derives from biopsy and could provide either a pure population of cells or a multicellular structure. The only restriction is the availability because it is very rare and though to obtain them. (3) So primary human cells could be used for 3D cell culture if a good source is available. Human stem cells or progenitor cells: this kind of cells might be a good alternative to the previous one because they are more stable, and stability is a key factor for 3D cell culture. With the discovery of IPS cells, the availability and ease of use of such cells are now truly compatible with 3D routine culture. The only drawback here is related to their differentiation. It must be clear which kind of cell is desired and the process needs to be followed very strictly to avoid non-desired cells. The main requirement from 2D to 3D cell cultures is to keep the cellular environment controlled and standardized as much as possible. To do so, it is important to provide enough nutrients and O2 to cells and to remove the waste products produced by the cells. (5) In 2D cell cultures systems, the nutrients are provided in a homogeneous way, while in 3D cultures a gradient will appears due to the three-dimensional organization of cells. The inner cells are less in contact with nutrient and O2, whereas the external layer of cell is directly in contact with the latter. The communication between cells outside their neighborhood is restricted to diffusion, in the liquid phase, of secreted messenger molecules. The saturation of the supernatant does not help to the cellular communication. If the growth rate is not properly controlled, it could lead to a necrosis of a part of the cell culture due to the lack of oxygen and nutrients. Necrotic cells will release messengers in the supernatant that will reach distant cell and so disseminate the necrotic message within all the cell culture. 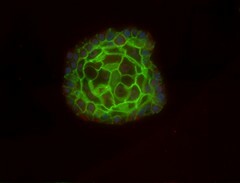 Inside 3D cell cultures, the only restriction is related to the density of the culture. If the cell culture is overpopulated there will be a group of cells that will not receive enough nutrients and oxygen and they will die. The optimal density depends on the kind of cells; the culture surface, the available volume for the cells growth and the 3D architecture itself of the culture. Another requirement is related to the ability to monitor and analyze the distribution of different substances in a complex biological cell environment. One option to study the microenvironment of 3D cell culture is to use computational modeling. The accuracy of those models depends on the amount of input variables factors used in the simulation but there is still a need of the experimental results to validate the models. Since organs are complex three-dimensional structure, it is necessary to better understand the processes and existing constraints while culturing in 3 dimensions. 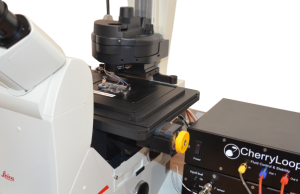 Before tackling complex organ-on-a-chip culture, simpler and more standardized models are needed: 3D cell culture. Thus, such models represent a first step in the understanding of the requirement for organ on chip manufacturing. Haycock JW. 3D cell culture: A Review of Current Approaches and Techniques. In 2011 [cited 2016 Sep 6]. p. 1–15. Ravi M, Paramesh V, Kaviya SR, Anuradha E, Paul Solomon FD. 3D cell culture systems: Advantages and applications. J Cell Physiol. 2015;230(1):16–26. American Type Culture Collection Standards Development Organization Workgroup ASN-0002. Cell line misidentification: the beginning of the end. Nat Rev Cancer [Internet]. 2010 Jun [cited 2016 Sep 6];10(6):441–8. Geraghty RJ, Capes-Davis A, Davis JM, Downward J, Freshney RI, Knezevic I, et al. Guidelines for the use of cell lines in biomedical research. Br J Cancer [Internet]. 2014 Sep 9 [cited 2017 Apr 27];111(6):1021–46. Pablo is part of the H2020-MSCA-ITN-ETN-DivIDe European network. LEARN MORE. 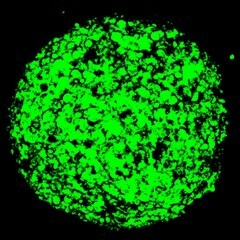 Are spheroids recapitulating basic physiology of human organs?